If you just want to get 'em all in one go! These started as few little sets on the Best of Anni Arts CD. The collection kept on growing and I had to keep adjusting the price. Eventually the collection came to be the equivalent of the Seasons and Reasons Club. The CDs were made by Cafe Press, but when they stopped offering that service, I removed the product. A while ago somebody asked about it, as it was still referenced somewhere - and purchased the collection which I sent as CD. I offered it at the price she had seen, although the collection had once again grown. Then this week I had another enquiery and sent the entire lot to a customer as staggered downloads. So I decided to offer it again! The ranges listed contain ALL individual sets and items in that range. It is HUGE! The usual combos are already big savings over the individual sets, but the ranges as listed total more than $400. You can also choose the collection on CD or USB via postal delivery for $3 extra, if you are in Europe, USA, or Australia. Please email me after purchasing with your preference and address. Do you like the MEGA combo? • You will need an unzip program like Winzip or similar for the zipped PDFs. Your computer should have some unzipping program. • Documents in PDF format need Acrobat Reader to open. Download Acrobat Reader for free. 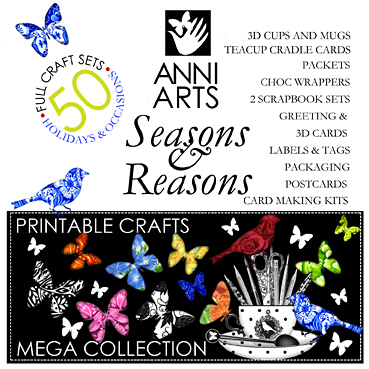 • You will receive the files as zipped digital craft downloads. Big sets have individual listed files.